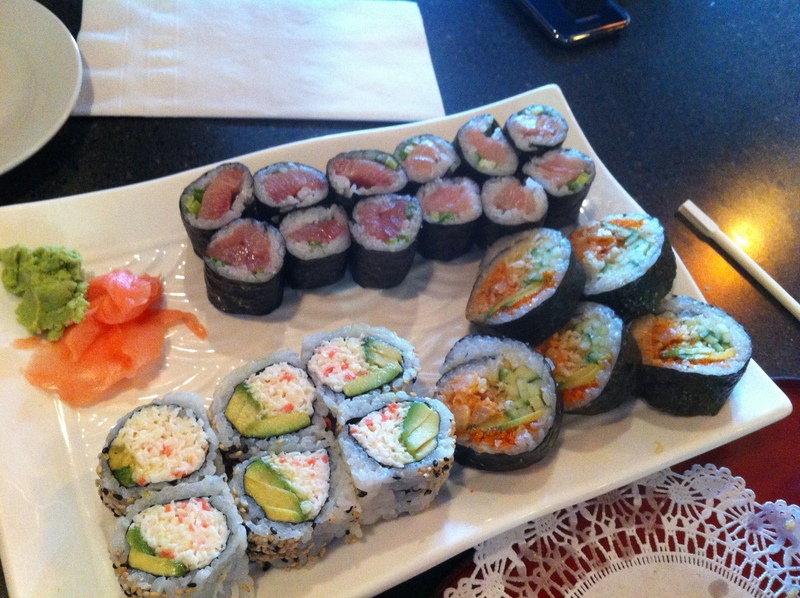 So I’ve reviewed Yume Sushi twice with mixed opinions. Great service, okay prices but not the best food. Being in the sushi crazed that I was in, my brother and I drove to Wa’s. Oh no… they’re closed for a number of days. Ok. Red Ember. Didn’t I see a post on their facebook page that they are now open on Sundays for lunch? Nope… my imagination. What to do? At 1:45pm in the afternoon, dining choices for sushi are limited to… Sakana, which honestly I’m not a fan of. What to do? I decided to go visit Yume because I know they don’t close between lunch and dinner. Plus, I decided to give them another chance. Entering with low expectations, I really just needed some raw fish in my tummy! Four tempura shrimps and five tempura yams. I have to say these were nicely fried and the batter was light and crispy. 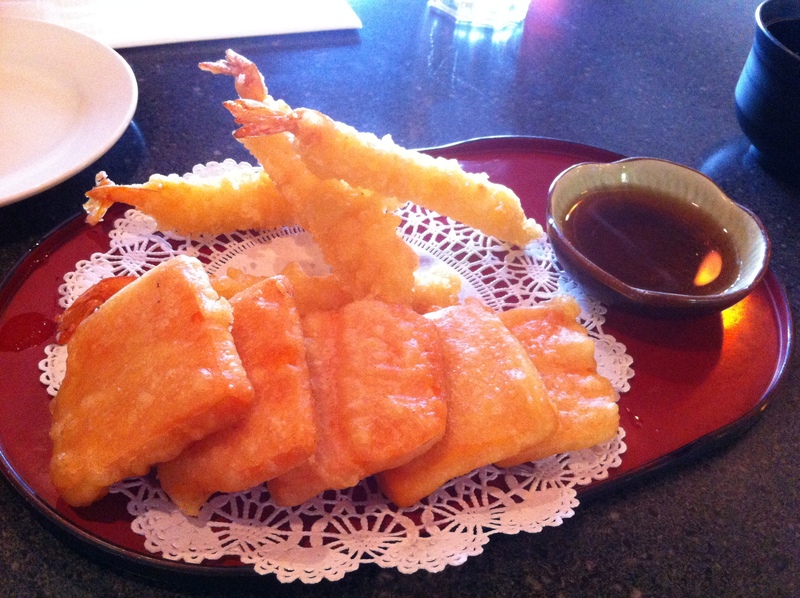 However, the tempura sauce was virtually tasteless… just like from my previous visit with the agedashi tofu. These rolls were not made well – they were packed very loosely so as I picked one up with my chopsticks, the part where the seaweed should meet opened up. I wasn’t a fan of the texture of the rice either – it was very mushed up and gummy. The hamachi and toro tasted ok but it wasn’t ultra fresh or anything. My brother did not enjoy his tempura cajun prawn roll as he felt it was a rip-off for what it was, and it didn’t taste that good. The california roll was for my toddler – he didn’t like the rice but ate all of the imitation crab meat and avocado. For $1, I thought the chopped scallop was more than decent. The tuna was soft, not frozen but it was not easy to chew apart. The salmon roe was very fishy… ack. Scallop was ok but quite thin. My brother said he has had better cajun prawn. 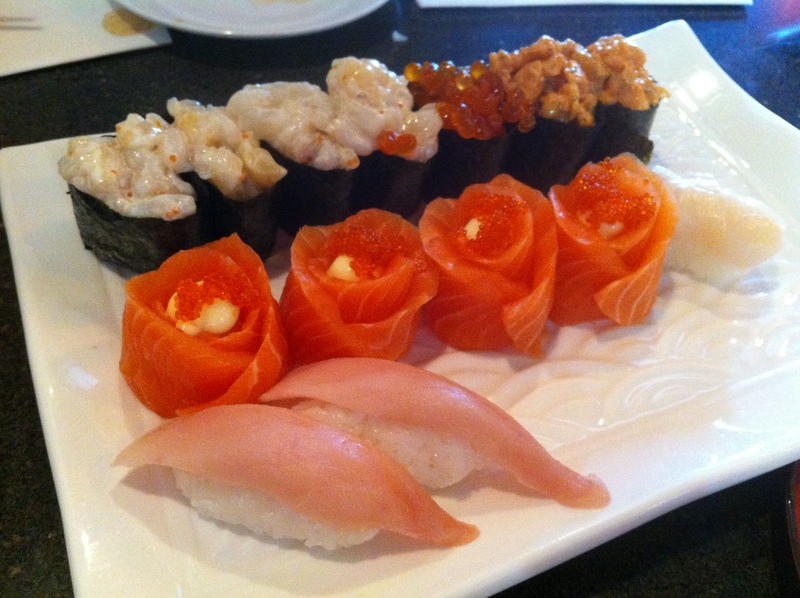 The Geisha, which I like to call the salmon rose, was very disappointing. The salmon was not fresh, the texture was a bit rough and the entire piece of sushi was just very small. I’ve had this in Hong Kong many times before and loved it, so I know what to expect. Yume, however, has failed to deliver. Service was also lacking today. I honestly did not enjoy my meal and felt that it has ruined my appetite. Prices, with the exception of the $1 nigiri, are actually quite high for the quality. I will not return to this place in the future and the next time I’m desperate, I’ll just go to T&T. Izumi is on a different caliber, lol! I only see Yume as a fast food type sushi place. If I want cheap sushi in my area I go to Sakura Sushi where the food is actually quite decent, cheaper than Yume and has way better service! I haven’t returned to Yume since this post and don’t plan to return.